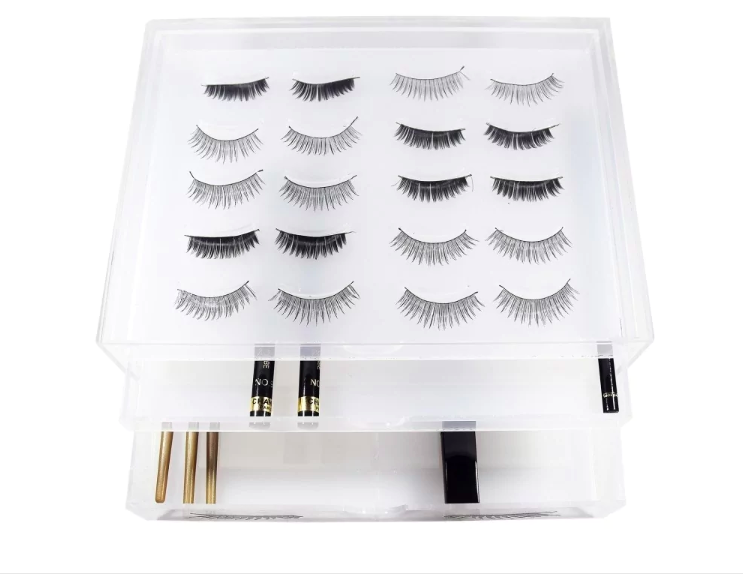 Fam, we found ways for you to organize everything from false lashes to batteries to tea bags to boots, and more! 1. An eyeglasses organizer that'll keep your pairs of specs way safer than stashed on top of your dresser or in a drawer. Sunglasses too! Get it from Amazon for $12.99+ (available in four styles). 2. 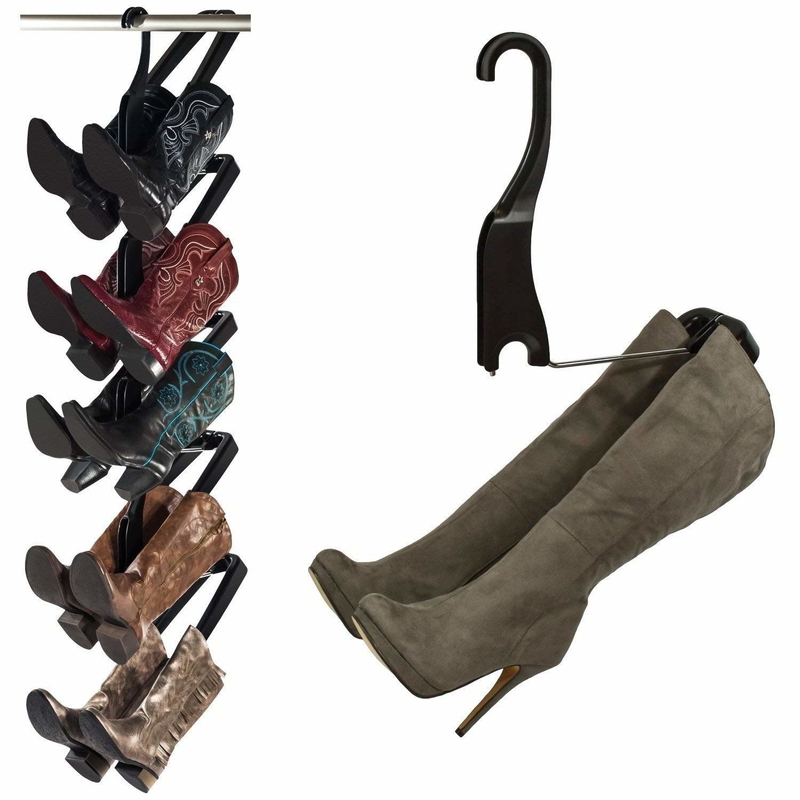 A boot rack to finally keep your beauts from getting creased, crushed, or forgotten entirely in their tombs (aka, shoe boxes). 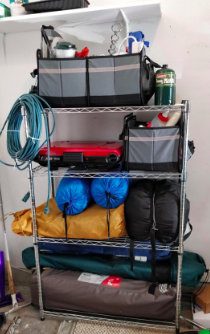 Get a rack (enough for five pairs of boots) from Amazon for $69.99. Check out more clever closet organizing tips. 3. A battery organizer for parking all your loose power sources instead of letting them roll around in your junk drawer where you'll forget about them before they expire. This *safely* holds 82 batteries of various sizes. You can store in a drawer or mount on a wall! 4. A cotton swab–coralling flower — it'll look great on your bath vanity and keep swabs from getting soggy before you can use them. It's also great for toothpicks! 5. A pair of plastic grocery bag wranglers light enough to hang on a hook on your wall *or* inside your kitchen cabinet. Get them from Amazon for $8.59. Want a sturdier option? Consider this cabinet door bag holder. Alternatively, you can stuff them in an empty facial tissue box! Get a set of eight from Amazon for $35.99. 7. 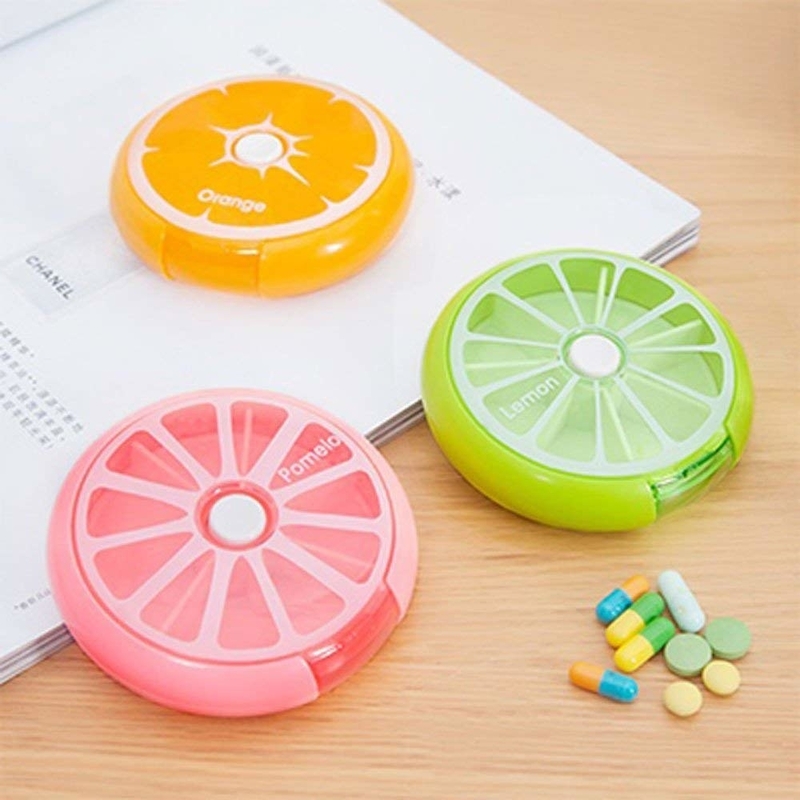 A travel-friendly pill organizer or compact weekly organizer that'll be solid alternatives to a bunch of bottles rattling around. 8. And a diabetic insulin cooler bag for daily, weekly, or travel use to make sure everything you need is in one tidy place. Includes two re-freezable 6 oz. gel packs for up to 12 hours of cold time and has closed cell foam insulation throughout the bag to protect supplies and medication. Get it from Amazon for $29.95 (available in three colors). Psst, have an epi pen? 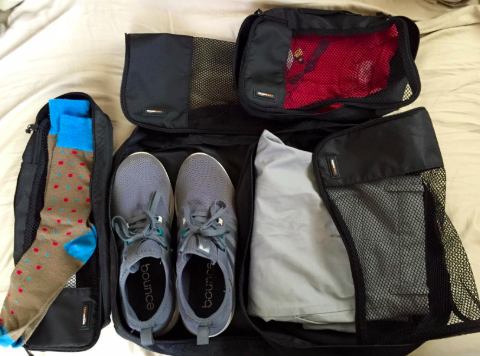 Check out this travel organizer. 9. A scarf organizer that'll make it easy to slip your accessories on and off — unlike the organizers of the loop variety! I own a loop scarf organizer and it's a pain to get scarves on and off of it. I clearly need to ~upgrade~. Get it from Amazon for $11.99+ (available in four finishes). 10. A grid organizer for holding on tight to everything from a pen to ear buds to USB cords. Get it from Amazon for $13.60+ (available in three colors). Check out a similar tablet carrier. 11. A bra organizer to keep your cups in shape and help you tell the difference between your ivory T-shirt bra and ivory lacy bra in a snap. Organizer sections are gentle on fine fabrics and fit cup sizes up to D. BTW, you should never invert bra cups to fit them into a drawer! Get it from The Container Store for $29.99 (holds 10 bras). 12. Or if you're a DD+ cup, a hanging closet organizer that'll provide ample room for keeping your bras in fine shape where you can see 'em. This one has six shelves, three drawers, and outside pockets. Oh, and it can hold up to 40 lbs.! Get it from Amazon for $39.99. Or check out this simpler version. And while you're at it, check out some more creative ways to organize your bras. 13. Mounted sponge holders to finally put those sauce and drink mix packets within eyesight so you aren't left thirsting for Kool-Aid, only to realize your packets are expired. RIP all my Crystal Light packets. Get a similar sponge holder from Amazon for $3.17. Check out more of this ~super organized~ pantry on Make Bake Celebrate and more of our pantry organizing tips. 14. A pencil organizer so a search for colored pencils when you're in need of a de-stressing coloring sesh won't stress you out even more. This organizer holds up to 72 pencils!!! Get it from Amazon for $10.99 (also available in black). Learn how to deal with more of your ~creative~ tools with our tips for organizing craft supplies. 15. A tea bag holder that can afford you some major kitchen cabinet room and help you keep track of how many bags you have left of your faves. Get it from Amazon for $9.99+ (available in three colors). Prefer a different caffeine source? 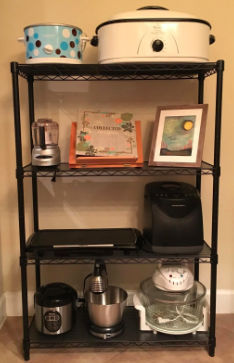 Perhaps a K-cup organizer would be of interest. 16. A sports caddy to park in your garage and then establish a rule that ALL the sports balls go in here when not in use, lest someone slip and fall on a stray tennis ball! Get it from The Container Store for $49 or a similar one from Walmart for $52.99. Take a gander at more storage options for your garage. 17. A hair styling station that'll handle your dryer, curling iron, brush, and bottles of hair product. You've suffered through too many hairspray avalanches during groggy mornings. Oh, and this will also fit on a towel rack. Promising review: "Works well under the sink. I bought this for my daughter to help clear some of her clutter in a small bathroom. Worked like a charm!" —Tina F.
Get it from Amazon for $15.95. 18. Fishing rod racks for your garage doors as a *legendary* use of space. Hardware included for easy, no tool installation on standard garage doors. If the door is a hard insulated or wood door, self tapping screws are not included but can be shipped at no cost. Can also be installed on walls and ceilings. 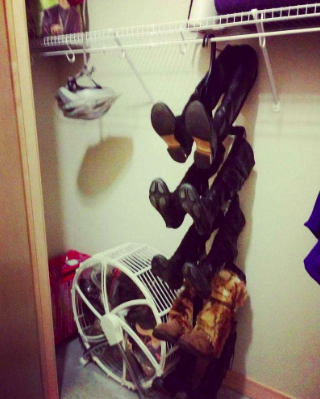 Give the inventor of these racks an award because they are damn clever! Get them from Amazon for $35 (available in two sizes). 19. A hanging jewelry organizer with necklace loops so your fave statement piece won't be a tangled mess next time you decide to wear it. Promising review: "I need to order a second one. I've recently become obsessed with jewelry, and the little holder I have had was a hot mess with necklaces falling everywhere and bracelets and rings in several locations. It's nice that I now have pockets for the smaller things and the Velcro hooks for the longer necklaces." —Me! Get it from Amazon for $7.99+ (available in three colors). 20. A stud earring tray you'll actually be able to easily grab the day's pair from, unlike pretty countertop jewelry organizers. The light color makes it easy to spot your desired pair. Oh, and you can fit rings on here, too! Get it from Amazon for $15.99. Also be sure to check out a book that organizes your earrings. 21. A car trunk organizer to pull double duty in organizing all kinds of miscellaneous stuff in the front seat thanks to some secure straps. Included tie-down strap system hooks into your trunk, around your seat backs, or onto your backseat child safety seat anchors to keep the organizer in place. Get it from Amazon for $24.97+ (available in three colors). 22. And a coin side pocket to hold onto your change instead of having to pry it loose from a sticky cupholder next time you're going through the drive thru. Please don't hand people sticky coins :(. Get it from Amazon for $21.99 (available in eight varieties). Need more care help? Take a gander at cheap products that'll make your car so much better. 23. Rolling underbed storage boxes for easy access to the random (heavy!) junk you shove under your bed. Get the set of four from Wayfair for $88.99. And check out how to use that dead space under your bed. 24. Honeycomb organizers — they may keep things just tidy enough in a sock or underwear drawer that never seems to regurgitate the item you want when you need it. 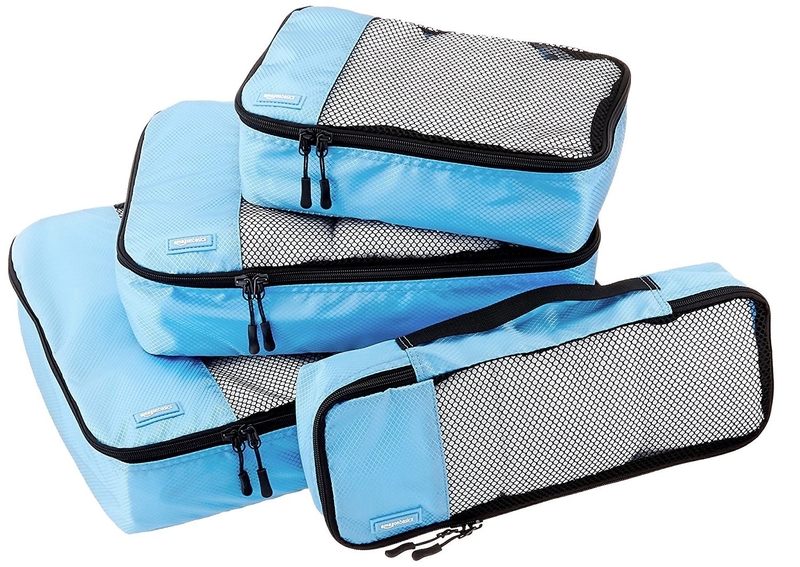 Get two organizers from Amazon for $13.49. 25. Or foldable boxes to help organize most anything you'd throw in your clothing drawers. Get it from Amazon for $13.78+ (available in two colors). 26. A makeup tower with all kinds of nooks for your prized lippies, nail polishes, and more! Get it from Walmart for $24.99 or a similar one from Amazon for $28.99. Get it from Amazon for $24.99 (available in clear or pink). If you can spare the counter space (lucky you! ), check out this 60 bottle countertop holder. 28. A medicine cabinet shelf to *securely* fit more stuff behind your bathroom mirror without causing an avalanche every time you open it. Get it from Amazon for $10.48+ (available in four varieties). 29. 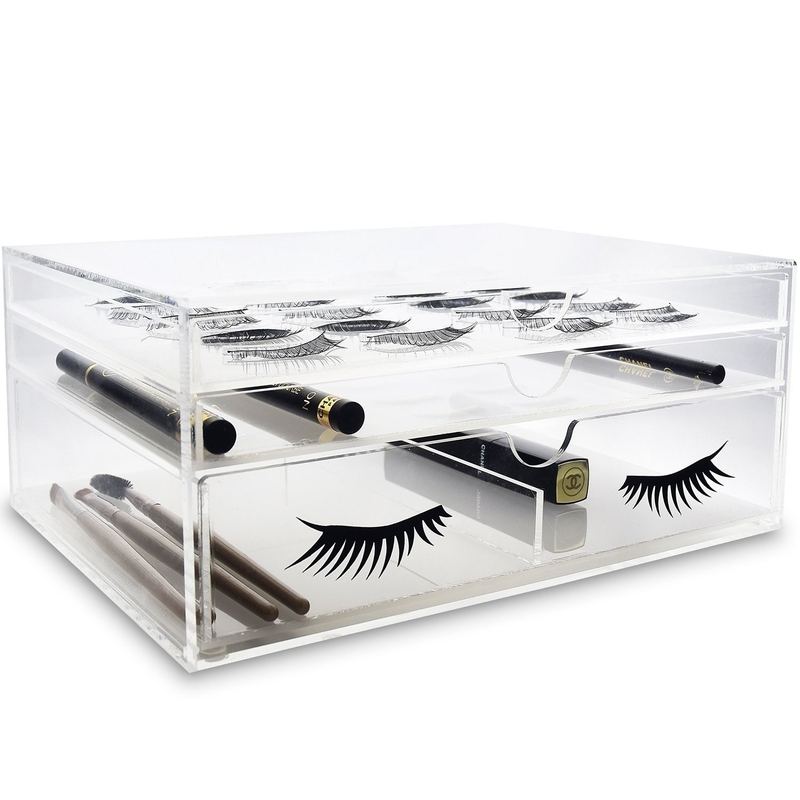 A false eyelashes beauty organizer that'll keep all your fluttery LEWKS in good standing. Get it from Overstock for $37.99. Or check out a travel organizer for three pairs from Amazon or a lash binder for 18 pairs from Tarte. 30. A ~floating~ kitchen utensils organizer to hold all the stuff that won't fit in a drawer. Can be mounted under a cabinet or on a wall. Just don't use it with knives!!! Get it from Amazon for $13.87. 31. An accordion-like pots and pan organizer that'll easily adjust with your growing organizing needs. The length expands to 30" and each rod is 6.5" tall to accommodate taller items. Synthetic rubber bumpers protect your delicate surfaces. Get it from Amazon for $34.99. 32. A *nice looking* dog feeder with plenty of space inside to keep some dog food or toys you've taken out of rotation. Lid top slides open and latches closed for storage. Includes two 32 oz. stainless-steel bowls. Get it from Amazon for $68.38+ (available in three colors). 33. Or if you went full throttle with the economy size dog food bag, this airtight food vault will keep kibble fresh AF. This thing's so legit that my former roommate's dog could tell the difference between kibble kept in this or kibble that'd been in a gallon ziplock for a few weeks at her grandma's house! Get it from Amazon for $23.34+ (available in three sizes). 34. A heavy-duty shelving unit with a weight capacity of 350 lbs. per shelf (!!!) in case you're a Costco devotee who buys stuff like soda, cleaning supplies, canned food, and other items in bulk. Get it from Amazon for $54.99+ (available in three sizes, two finishes). 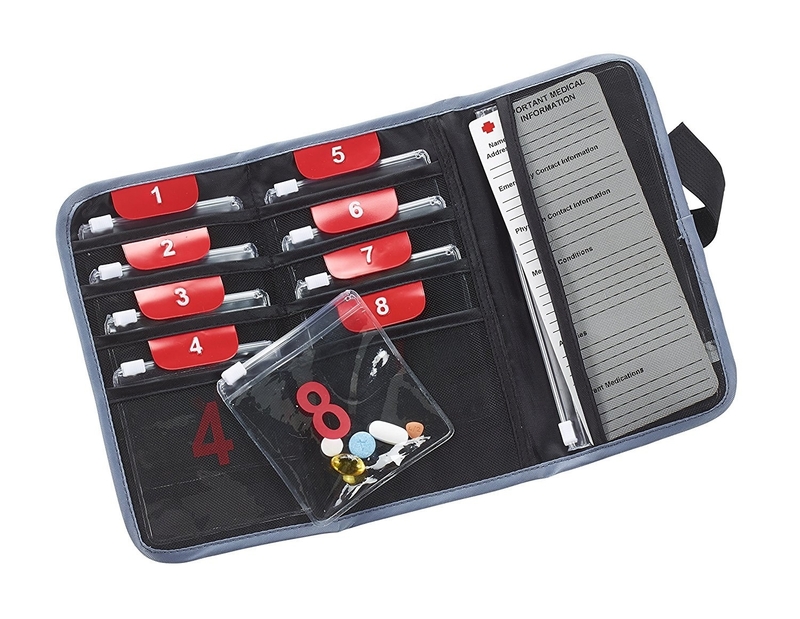 Promising review: "I used these on a recent trip to Scandinavia and they helped me keep my backpack nicely organized. The cubes are really floppy but they'll take shape as you fill them. I liked that I could fold them or squish them into my pack after filling them. I didn't have any problems with the zippers and none of my cubes tore after two weeks of regular use. The zippers don't have a high-quality feel to them, but they opened and closed without snagging." —Quincy C.
Get a set of four from Amazon for $20+ (available in six colors).